A neighbor buddy called me this morning with a question? Somebody clipped one of cars and tore the corner on his rubber front bumper. Asked my opinion. I suggested using 5 minute epoxy; then staple on the inside. Anyone ever attempt a repair like this? Haven't seen it yet; but probably will. 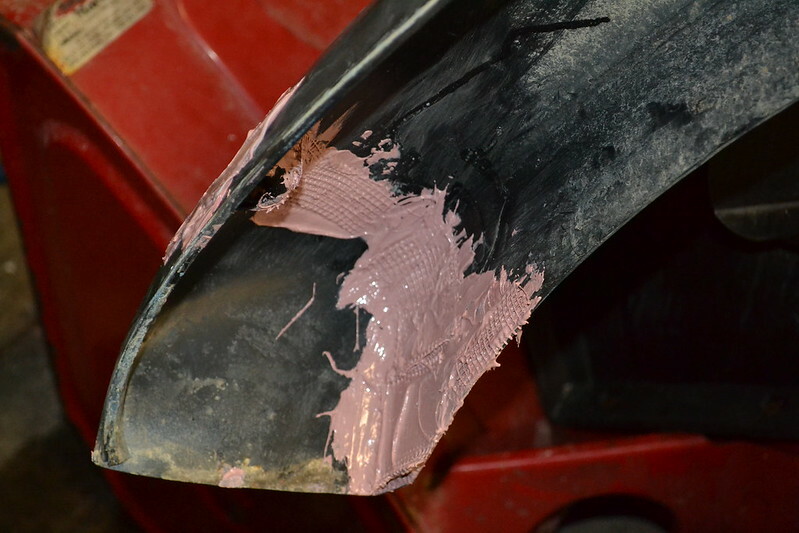 Bondo makes a fiberglass repair compound, more flexible than it's standard pink body patch. It doesn't sand worth a darn, but it sticks. Unbolt bumper cover and throw away. Spend $150 on new cover, have painted to match, then install. I used a bumper repair kit on a busted fender flare.After I was done it looked like new and was very strong. if i ever get out of the rehab place and home I will be back on. Had a blood clot;lost a leg. Computer acting wierd. Your bud's rubber bumper must low on the list, Fred.